Skittles has never been afraid to get weird with its commercials, like the “Skittles Pox” ad that has been running forever and suggests that the little candies are actually the byproduct of an infectious disease spread by teenagers who pick delicious sores off of each other, but the brand has transcended that level for an entirely new breed of weird commercials. It’s all, naturally, a tease for the upcoming Super Bowl, which is sort of like the Super Bowl of advertising, but Skittles has decided to forego doing a traditional ad in favor of a Skittles musical that will be performed on Broadway. The show will only be seen one time, and if that’s not weird enough, the musical will star legitimate actor Michael C. Hall. To promote the show, Skittles has released an appropriately weird meta-teaser that involves Hall talking to his therapist about how stupid it was for him to agree to star in a musical commercial that will only be seen one time on Broadway. It features a scarecrow that represents Hall’s anxieties and at the end it all transforms into being part of the Broadway show itself, so if that doesn’t convince someone to buy Skittles than we have no idea what’ll do it. The show will be held at The Town Hall Theater in Times Square on February 3, and though Deadline says tickets originally started at $30, the only ones still available are over $200. “Some” of the proceeds will go to Broadway Cares/Equity Fights AIDS, but $200 is still a lot of money to pay to see a commercial—even if that commercial is Skittles Commercial: The Broadway Musical. 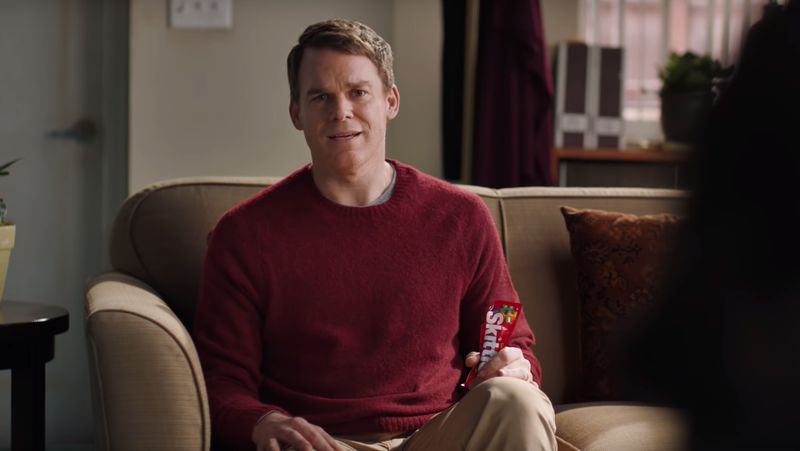 Hopefully the guy with Skittles Pox can either make an appearance or get free tickets, because he deserves to be celebrated just as much as Michael C. Hall. Also, don’t be surprised when Skittles spoils the joke by turning clips from the musical into an actual Super Bowl ad, which is definitely going to happen.